Yoshi's Crafted World preview: "Expected it to do a little more than rely on the cute appeal"
Yoshi continues to delight, but does it really do enough with its papercraft world? 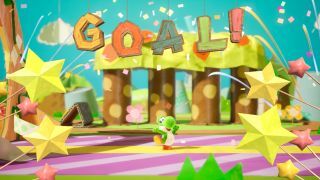 If you're a follower of all things Nintendo, you'll have learned from last week's Nintendo Direct that a slice of Yoshi's Crafted World already dropped in the form of a delightfully compact demo, a small slice of action that’s designed to give you a taste of what's to come in Yoshi's latest adventure. I recently had the opportunity to play two more levels of the game, entitled Poochy's Tape Trail and Deceptive Doors, and it continues to be an absolute delight of a game that plays against all that's dark and dreary elsewhere in the world. Building on the success of Yoshi's Woolly World on 3DS and Wii U, Yoshi's Crafted World continues the idea of a handcrafted world for Yoshi to explore, though this outing ditches the fuzzy of wool and yarn in favour of an arts and craft style. It’s a world where paper and recycled goods are king, and it's held together with more tape and elastic bands that a Blue Peter project back in the '90s. But that means, like Wooly World, Yoshi's Crafted World is the definition of sweetness, and part of the fun is figuring out what goods were used to make each little element of the game. It blends perfectly with Yoshi's general joyfulness and the almost peaceful quality of the gameplay. All the collectables you know and love are here, like the red coins and the smiley flowers, hidden away within the creases and folds of Yoshi's new world. And I say that often literally, as Yoshi's Crafted World makes use of a new 2.5D world where you can shoot his eggs into the foreground and background of each stage, with the level itself weaving between these areas too in an almost maze-like fashion. That expands the potential for the level design and the hidden collectables greatly, enhancing the puzzling nature of traditional Yoshi gameplay tenfold. The main element of play in Deceptive Doors is interacting with doors that you have to spin using your eggs, moving between foreground and background as you attempt to deal with Shy Guys lobbing paper shurikens at you. Half of the puzzle elements have you attempting to figure out which doors have platforms only on one side, turning them to give you access to new areas – which can be hilariously hazardous when played in co-op, as is possible throughout the entire game. It's a neat little trick, and gets you interacting with all the elements of the level more so than any Yoshi game that has come before it. The same can be said for Poochy's Tape Trail. This level, as the name suggests, involves working your way through a complex maze system with your old pal Poochy. Coils of green paper must be unfurled to open up paths to new areas, which eventually reveals a level that turns and twists in and upon itself against a backdrop where papery clouds are suspended on visible strings. The only thing that holds Yoshi's Crafted World back is the inevitable comparisons to another papercraft title – Tearaway. The PS Vita title (and later Tearaway Unfolded on PS4) absolutely nailed the papercraft world, complete with the ability to edit, change and even add your own elements to it. Despite the Switch's amazing touchscreen, there's no element of that here, and the levels I have played through so far almost lack the density of papercraft elements that made Tearaway so memorable. Levels in Crafted World can feel a bit sparse and, while it's oozing with charm, it's like the papercraft elements haven't been pushed far enough. Karakuri Yoshi anyone? I was almost hoping that Yoshi's Crafted World might take on some elements from other Nintendo games that utilise this kind of idea, such as Paper Mario or even The Legend of Zelda: A Link Between Worlds. It's rare that I want a game to actively take on elements of other titles, but it’s difficult to escape the feeling that Yoshi's Crafted World could push on beyond the confines of a classic Yoshi title a little more than it’s currently doing. Crafted World does take some small steps to remedy this though, by letting you play through the reverse side of the levels, almost like you're being allowed to walk around the other side of the diorama and peer in, behind the scenes. Although it's not clear how many of the levels you'll be able to play in reverse, they do offer a slightly different challenge to the frontside version. Poochy's Tape Trail's reverse, for example, gets you hunting down Poochy's three puppies, and rather than having to find collectables, you're basically asked to find the three pups as quickly as possible. It's from this rear view though, that you get an amazing look at how the levels are put together literally with paper and tape. You'll see the cereal boxes and milk cartons that have been used to make platforms, the little juts that keep the hedges standing, and even Shy Guys holding up butterflies on sticks. It's all utterly adorable, there's no denying that. It's just a shame that this won't be one to break the mould much more than Yoshi's Woolly World. This will be a wonderful addition to the Switch library, especially as a family-friendly co-op experience, I just expected it to do a little more than rely on the cute appeal. Yoshi's Crafted World is out exclusively on Nintendo Switch on March 29.